I love the guys and gals over at Lawrence Livermore National Laboratory (LLNL). 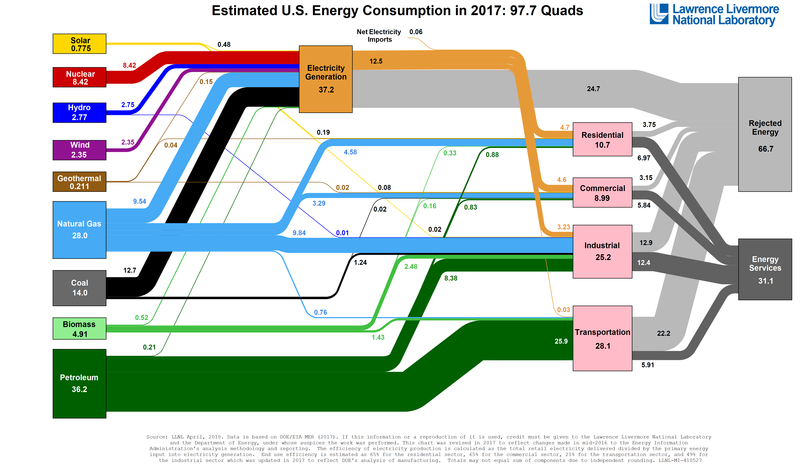 They tend to produce some of the coolest energy studies with nifty graphics (all the while hiding the space aliens from us). Earlier this year, as it does every year, LLNL published the U.S. energy flow chart which illustrates total US energy production by source and how it is consumed. Take a minute to follow the flow and then look at the Rejected Energy versus Energy Services. There is twice as much Rejected Energy as Energy Services. If we look a bit further at the “Transportation Box”, the ratio of Rejected Energy to Energy Services is about 4 to 1. Here’s the cool part: Rejected Energy is waste energy that does no meaningful service. Rejected Energy does not light a light bulb, it does not drive a car, and it does not heat a home. It gets transferred to the environment as entropy and most commonly as waste heat. That is why, for example, an internal combustion engine gets hot. Most of the energy of the fuel exploding in the piston chamber generates heat, while the remainder drives the piston and moves the car. Energy efficiency of an internal combustion engine can be as high as around 50% for the largest diesel engines, but is typically 20% to 30% for a passenger vehicle’s internal combustion engine. Effectively then, when you fill up your gas tank, for every 1 gallon of gas that is bought and used to propel your car down the road, about 3 gallons of gas are bought and used to heat up the environment around the road. Great in Alaska or colder climes, but quite useless in Texas or warmer climes.